Rotator: One who turns or gyrates. The “Rotator Cuff” is comprised of 4 tendons that encapsulate the head of the arm bone securing it to the shoulder blade-your ball and socket joint (see the circled tendons in picture below). It’s one of the body’s most versatile joints allowing us to paint, plant, draw, farm, write, throw a ball, etc. Our shoulder joint was a major development in our evolution or, if you like, part of the divine plan for humans to be able to do all the things we do. Imagine not being able to make a circle with your arm and all the things you could not do…………… Without the support of the rotator cuff tendons (which transfer tension from muscle to bone – which keep the arm bone in place, the arm bone would keep popping out of the socket. 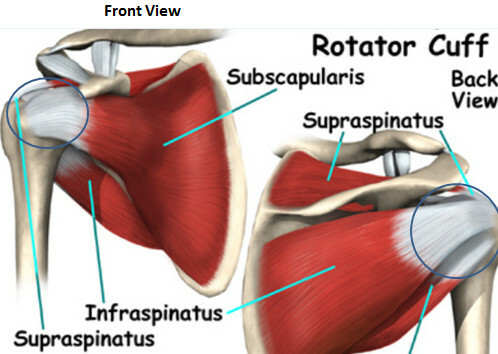 Most orthopedic problems of the shoulder can be prevented by keeping the rotator cuff healthy. Similarly our shoulder joint has all this flexibility but the price for this gyrating joint is its propensity to injury if not cared for diligently. The strain on the rotator cuff (tendons) comes from chronic poor posture, repetitive overhead motion or the chronic static holding of the arms out – i.e. driving a long commute year in year out. This creates chronic muscle imbalances and dysfunction leading to tendon strain. The tendons are the anchors for muscle into bone. Falls and accidents can also tear tendons of the rotator cuff but I wonder how bad the tear would be if the tendons were not chronically strained? How to keep the rotator cuff healthy? Too much emphasis is placed on treating the tendon when injured. We should treat the tendon if injured but the idea is prevent this from happening. Keep the muscles clear of trigger points and balance its musculature. Do the exercise from the “save your shoulders blog.” Seek out a qualified massage or physical therapist or yoga teacher and learn therapeutics for your shoulders. Improve the ergonomics of your work station and micro break throughout the day. Merely doing strength exercises and stretching maybe exacerbating a compromised rotator cuff tendon without you knowing it. If you have any shoulder issues please get help now before it turns into a tear. Your shoulders need constant functional movement to maintain healthy rotator cuffs. It’s a physical law called “The law of stimulus and renewal” Either you are regenerating your muscles and tendons with healthy movement or degenerating them with poor movement and posture. Do not forget “save your shoulder” workshop October 22nd. Click here for more information.